Dr. Michael Cullinan is an Assistant Professor in the Walker Department of Mechanical Engineering at the University of Texas at Austin. Dr. Cullinan's research focuses on the development of novel nanomanufacturing systems and on finding ways to exploit nanoscale physical phenomena in order to improve existing macroscale devices and to create novel micro- and nanoscale devices for energy and sensing applications. 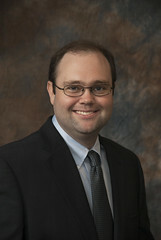 His research interests include the design and development of nanomanufacturing processes and equipment, the application of nanoscale science in engineering, the engineering of thin films, nanotubes and nanowires, the manufacturing and assembly of nanostructured materials, and the design of micro/nanoscale machine elements for mechanical sensors and energy systems. Prior to joining the University of Texas in 2013, Dr. Cullinan was a National Research Council Postdoctoral Associate at the National Institute of Standards and Technology in Gaithersburg, Maryland. Dr. Cullinan received his Ph.D. in Mechanical Engineering from the Massachusetts Institute of Technology (MIT) in 2011 and also holds an M.S. (2008) in Mechanical Engineering from MIT as well as a B.S. in Engineering and a B.A. in Economics from Swarthmore College.